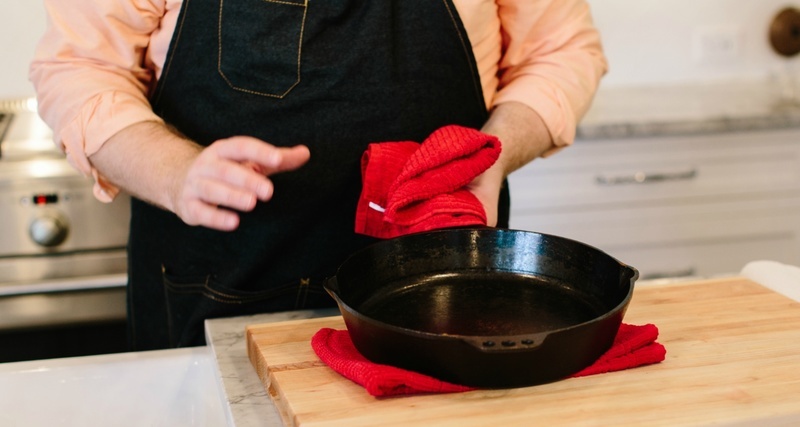 While there are certainly countless ways to season and maintain a cast iron skillet to keep up its shiny patina (looking at you Grandma Sue), we have a few methods that we prefer here at Southern Kitchen. Learn three Southern retaurant chefs, plus our own chef Jeffrey Gardner, season their skillets at home. 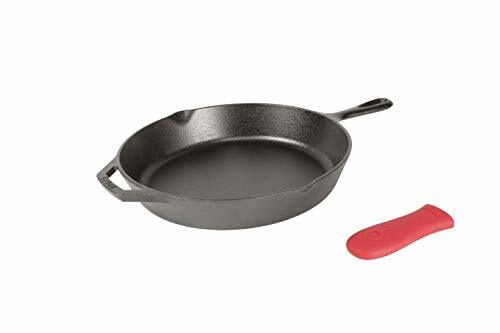 Whether searing a pork loin or baking an apple pie, the cast iron skillet has proven to be one of the most versatile, long-lasting cooking tools in the Southern kitchen. This popular piece of cookware, often romanticized by both professional and home cooks, is durable, practical and a must-have in traditional Southern cooking. Becoming familiar with the cleaning and caring process for your cast iron, known as seasoning, can seem intimidating at first. 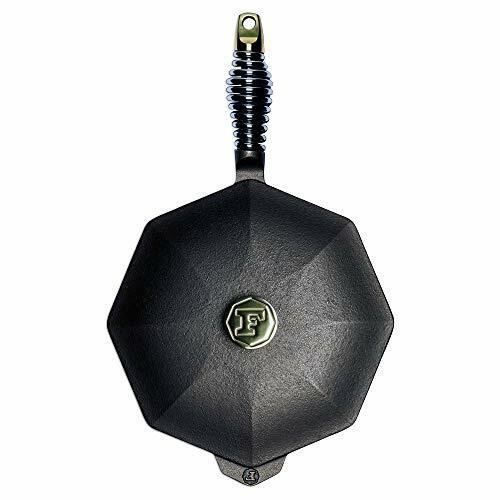 With the proper care, your cast iron has unique potential to last generations, thanks to the skillet’s heavy duty metal. 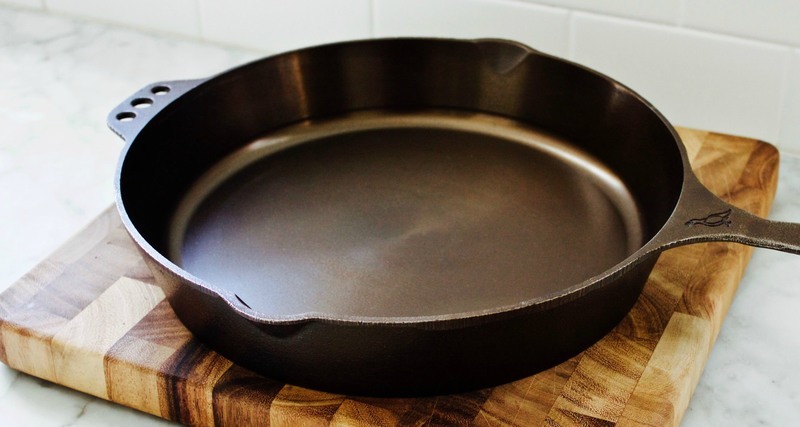 The importance of seasoning is simple: Your cast iron has a protective coating, called the patina, which can rust when mixed with soap and water. Aside from preventing rust development, seasoning your cast iron helps to keep your food from sticking to the surface of the skillet. Traditionally, the skillet is coated in a fat such as bacon grease or lard. The skillet is then put in the oven at 350 degrees for one hour to dry the oil, which forms the protective coating. You should season once a month, but it really depends on how often you use your cast iron and the kinds of food you cook in it. Although using lard to season is the most popular approach in the South, there are plenty of other options. Here's what three Southern chefs recommend for omnivores, vegetarians and vegans. Jason Bergeron, Executive Chef at Orlando, Florida’s Chroma Modern Bar & Kitchen says his kitchen uses oil with a very high smoking point (the temperature at which an oil or fat begins to give off visible smoke), such as canola and even avocado oil at the restaurant. “This allows us to get the pan very hot on the initial seasoning and not have the oil catch fire or smoke like crazy,” Bergeron said. The molecules begin to form brand new molecules in the oil — a process called oil polymerization — at the smoke point and creates the sought-after patina. Vegetarians may find safflower oil, extracted from the safflower plant, to be a good alternative to vegetable oil. Safflower oil itself is odorless and flavorless, and is a nice choice for anyone — meat-eaters and vegetarians alike — looking for an oil that doesn’t have a pronounced flavor. Randy Talley, co-owner of Green Sage Cafe in Asheville, North Carolina, urges vegans to season their cast irons with refined coconut oil. Refined coconut oil is derived from dried coconut meat, the white lining contained within the shell of a coconut, known as copra. Coconut oil also has many health benefits including antibacterial and immunity-boosting effects. Refined coconut oil differs from unrefined coconut oil in that the refined oil has been bleached and deodorized. 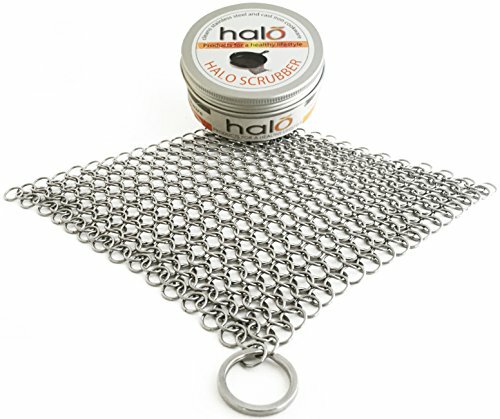 It also has a higher smoke point than unrefined coconut oil, which has the same smoke point as butter or lard. “Coconut oil is the superfood oil of the future,” Talley said. “What we do every time after we cook is we wash the pan with hot water and a green scrubby pad, then heat off all the water just on the stove. After that we put coconut oil back in the pan to season the skillet,” Talley said, demonstrating the stovetop method for seasoning cast iron. The stovetop method is not as commonly used as the oven method — and threatens a smoky kitchen — but still gets the job done. To season your skillet on the stovetop, place it over high heat and let it get screaming hot. Remove the skillet from the heat, and rub oil into the pan with a paper towel. Put the skillet back on the stovetop over medium heat for about 10 minutes, letting the oil dry completely. Pro tip: crack a window if you’re using this method.